Treatment of periapical actinomycosis includes extraction of the involved tooth; however, indications for and timing of implant therapy remain unclear. In this case report, we describe treatment of apical actinomycosis in a 63-year-old woman following tooth extraction. After monitoring the patient for 6 months, implant therapy was carried out and remained successful after 1 year follow-up. Actinomycosis is a chronic granulomatous infectious disease characterized by suppuration, abscess formation and draining sinus tracts. Clinical and radiographic manifestations of apical actinomycosis are usually indistinguishable from common apical periodontitis.7 Actinomycotic infection slowly spreads to contiguous tissues without regard for tissue planes.8 Although nonsurgical endodontic treatment has been successful in most cases, some do not heal, even after removal of the tooth. The most common factor associated with lack of healing is the presence of strains of Actinomyces.9 Sakellariou10 reported 47 cases where lack of periradicular healing after endodontic treatment was associated with strains of Actinomyces. A. israelii is the most common species found in periapical infections. The genus Actinomyces contains species of bacteria that are gram-positive, pleomorphic or filamentous, non-spore-forming and anaerobic or micro-aerophilic. To the best of our knowledge, this report is the first to describe implant therapy at a site with a recent history of periapical actinomycosis. A 63-year-old woman was referred to the graduate periodontology clinic at the faculty of dentistry, University of Manitoba, Winnipeg, Manitoba, with the main complaint of moderate, episodic pain in the area of tooth 44. An allergy to sulfanomides had been documented in her medical history. Figure 1: Radiograph showing a periapical radiolucency associated with tooth 44 along with gutta-percha extending through the apical foramen. The patient's periodontal record indicated satisfactory oral hygiene (modified O'Leary plaque score12 = 8%). On examination, the existing dentition in the lower sextants appeared periodontally healthy. She was wearing a complete upper denture. 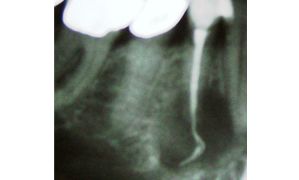 A panoramic radiograph revealed an overfilled root canal at the apex of tooth 44 (Fig. 1). The differential diagnosis included periapical abscess, periapical cyst and granuloma. The tooth was extracted. At 6 months follow-up, periapical and subsequent cone-beam computed tomography showed a radiolucent lesion at the healing site. Exploratory surgery was planned to acquire tissue for histopathologic examination and to debride the area. A full thickness flap was raised and an osteotomy was performed using a trephine bur to expose the pathologic tissue. On removal of the cortical buccal plate, a bony lesion was detected from which a yellow–white aggregate material (similar in appearance to cottage cheese) was removed for histologic investigation (Fig. 2). The lingual cortical plate was intact. A biopsy specimen was taken from the periapical nonhealing area (4 mm below the alveolar crest) as well as adjacent normal-appearing bone. Immediately after surgery, the biopsy specimen was immersed in 10% neutral buffered formalin and dispatched to the pathology laboratory. The remaining affected area was completely debrided and irrigated with saline solution. The flap was reapproximated and sutured closed with 5-0 extended poly-tetra fluoroethylene sutures (Gortex, Gore, Flagstaff, AZ). The patient's postoperative home care instructions included rinsing her mouth with 0.12% chlorhexidine gluconate (Peridex, 3M ESPE, West Palm Beach, FL) mouthwash and a prescription for amoxicillin (500 mg, 3 times a day for 7 days). The sutures were removed 10 days later. Healing was uneventful and the patient reported only mild discomfort and swelling around the surgical site. Histologic examination revealed fragments of fibrous and fibrovascular connective tissue containing moderate to dense mixed and chronic inflammatory cell infiltrates (Fig. 3). Bacterial colonies exhibiting club-shaped filaments surrounded by neutrophils were observed. Also seen were speckles of vital bone, collections of foamy macrophages, fragments of foreign material consistent with root canal filling, a fragment of polarizable foreign material of unknown origin and products of hemorrhage. The pathologic diagnosis was a lesion containing bacterial colonies consistent with Actinomyces. Figure 2: Yellow–white aggregate material (similar in appearance to cottage cheese) inside the bony lesion. Figure 3: Gram's stain showing an abundance of gram-positive, filamentous aggregates of bacteria, characteristic of Actinomyces. Figure 4: Postoperative photograph 4 weeks after exploratory surgery showing no clinical signs or symptoms of infection. A full-thickness flap was elevated to the extent that the apical portion of the alveolar ridge at the buccal and lingual plates was visible (Fig. 5). A narrow platform implant, 3.5-mm diameter, 10 mm long (Replace Select Tapered, Nobel Biocare, Göteborg, Sweden) was installed at the tooth 44 position (Fig. 6). Implant stability was confirmed by an insertion torque test (> 35 N cm) and a healing abutment was installed immediately after implant placement (Fig. 7). The peri-implant area was examined at 1, 2 and 4 weeks and at 3, 6, 12 and 18 months postoperatively. The patient reported no complications, and there was no infection, pain, bleeding or swelling. Peri-implant mucosa appeared a healthy, normal pink colour. At 18 months postoperatively (14 months after the implant restoration), crestal bone loss was less than 2 mm from the initial level. Probing depth was 3 mm all around. There was no implant mobility. Recession was less than 1 mm. Decreased translucency within the intrabony component of the peri-implant bone defect was apparent on radiographs (Fig. 8). The crown met the patient's expectations in terms of shape, dimensions and colour. Figure 5: Examination of the alveolar bone revealed no visible signs of bone pathology on the buccal or lingual plate. Figure 6: Periapical radiograph taken immediately following placement of a 3.5-mm-diameter implant in the previously infected area. Figure 7: Clinical photograph of the surgical site 4 weeks after placing the implant with a flared healing abutment. Figure 8: Periapical radiograph 18 months after installation of the implant. The radicular radiolucency decreased markedly over the period of treatment. Clinical and radiographic manifestations of apical actinomycosis are usually indistinguishable from common periapical pathoses.7 Periapical actinomycosis should be included in the differential diagnosis in cases where a periapical lesion has not responded to appropriate endodontic treatment. Actinomyces has been shown to prevent normal periradicular healing following conventional endodontic therapy, even after removal of the tooth as the bacteria are able to survive in periapical tissues outside root canals.14-16 In such cases, surgical intervention along with long-term antibiotic treatment may be necessary to enable healing. Clinical reports have suggested that a history of periodontal or endodontic infection is a predictive marker for implant infection and failure.17-20 Although several studies21-23 have supported immediate implant therapy at infected sites, this approach requires thorough debridement and achieving primary stability of the implant to allow osseointegration and subsequent implant survival. Further long-term controlled clinical trials are needed to investigate this approach. Proper management of implant candidates with a history of local infection requires early diagnosis of the infectious disease and the administration of appropriate medications. Of paramount importance is the patient's compliance with respect to regular attendance at appointments, drug therapy and patience with the long-term management of the disease, the implant therapy and necessary follow-up. In this article, we describe a clinical picture of chronic periapical inflammation that, on histologic examination, revealed the presence of Actinomyces colonies. Successful treatment of actinomycosis made it possible for us to offer the patient the option of implant therapy in the affected area. The patient was followed for 18 months after installation of a dental implant at the previously affected site, and we intend to follow the case for a longer period to ensure the success of the therapy. Dr. Angaji is a periodontist in Winnipeg, Manitoba. He was senior resident in the graduate periodontics program at the University of Manitoba's faculty of dentistry when the article was written. Dr. Brar is a periodontist in Winnipeg, Manitoba. He was senior resident in the graduate periodontics program at the University of Manitoba's faculty of dentistry when the article was written. Acknowledgements: We thank Dr. Stephen Ahing, division head, oral diagnosis and radiology at the faculty of dentistry, University of Manitoba, for his valuable comments. Adell R, Eriksson B, Lekholm U, Branemark PI, Jemt T. Long-term follow-up study of osseointegrated implants in the treatment of totally edentulous jaws. Int J Oral Maxillofac Implants. 1990;5(4):347-59. Romeo E, Chiapasco M, Ghisolfi M, Vogel G. Long-term clinical effectiveness of oral implants in the treatment of partial edentulism. Seven-year life table analysis of a prospective study with ITI dental implants system used for single-tooth restorations. Clin Oral Implants Res. 2002;13(2):133-43. Avivi-Arber L, Zarb GA. Clinical effectiveness of implant-supported single-tooth replacement: the Toronto Study. Int J Oral Maxillofac Implants. 1996;11(3):311-21. Schwartz-Arad D, Chaushu G. The ways and wherefores of immediate placement of implants into fresh extraction sites: a literature review. J Periodontol. 1997;68(10):915-23. Barzilay I. Immediate implants: their current status. Int J Prosthodont. 1993;6(2):169-175. Becker W, Becker BE. Guided tissue regeneration for implants placed into extraction sockets and for implant dehiscences: surgical techniques and case report. Int J Periodontics Restorative Dent. 1990;10(5):376-91. Jeansonne BG. Periapical actinomycosis: a review. Quintessence Int. 2005;36(2):149-53. Sakellariou P. Periapical actinomycosis: report of a case and review of the literature. Endod Dent Traumatol. 1996;12(3):151-4. Esposito M, Grusovin MG, Talati M, Coulthard P, Oliver R, Worthington HV. Interventions for replacing missing teeth: antibiotics at dental implant placement to prevent complications. Cochrane Database Syst Rev. 2008;(3):CD004152. Happonen RP. Periapical actinomycosis; a follow-up study of 16 surgically treated cases. Endod Dent Traumatol. 1986;2(5):205-9. Weir JC, Buck WH. Periapical actinomycosis. Report of a case and review of the literature. Oral Surg Oral Med Oral Pathol. 1982;54(3):336-40. Ayangco L, Sheridan PJ. Development and treatment of retrograde peri-implantitis involving a site with a history of failed endodontic and apicoectomy procedures: a series of reports. Int J Oral Maxillofac Implants. 2001;16(3):412-7. Oh TJ, Yoon J, Wang HL. Management of the implant periapical lesion: a case report. Implant Dent. 2003;12(1):41-6. Karoussis IK, Salvi GE, Heitz-Mayfield LJ, Brägger U, Hämmerle CH, Lang NP. Long-term implant prognosis in patients with and without a history of chronic periodontitis: a 10-year prospective cohort study of the ITI Dental Implant System. Clin Oral Implants Res. 2003;14(3):329-39. Polizzi G, Grunder U, Goené R, Hatano N, Henry P, Jackson WJ, et al. Immediate and delayed implant placement into extraction sockets: a 5-year report. Clin Implant Dent Relat Res. 2000;2(2):93-9. Siegenthaler DW, Jung RE, Holderegger C, Roos M, Hämmerle CH. Replacement of teeth exhibiting periapical pathology by immediate implants: a prospective, controlled clinical trial. Clin Oral Implants Res. 2007;18(6):727-37. Epub 2007 Sep 20. Villa R, Rangert B. Immediate and early function of implants placed in extraction sockets of maxillary infected teeth: a pilot study. J Prosthet Dent. 2007;97(6 Suppl):S96-108. Lindeboom JA, Tjiook Y, Kroon FH. Immediate placement of implants in periapical infected sites: a prospective randomized study in 50 patients. Oral Surg Oral Med Oral Pathol Oral Radiol Endod. 2006;101(6):705-10. Epub 2006 Mar 22.